Deep Creek Guest Cabin, nestled amongst old cottonwoods off the Old River Road on five secluded acres in the heart of Paradise Valley, is the perfect retreat from the stress of everyday life, whether you stay for a week-end or two weeks. Built in 1996 in the grounds of lovely old Deep Creek House, the cabin has a comfortable western feel while offering every amenity needed for a truly restful stay. The open floor plan and high ceilings make for plenty of elbow room and a sense of space. Four can sleep here, and there is a full bathroom with tub and shower and plenty of storage space. Too relaxed to do anything' Then sit a while in one of the overstuffed rocking chairs by the large picture window - the perfect spot for watching wildlife of just reading one of the many good books from the selection on the shelves. 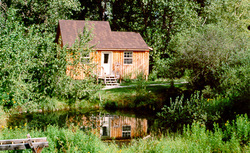 Or laze in the sun by one of our two stream fed ponds and watch the brook trout rise and swirl. If you are feeling a little more energetic, you are welcome to catch the fish rather than watch them and make a delicious meal in the fully equipped kitchenette. Once you are ready to explore the area, you will realize why we call it Paradise Valley. This is the heart of Montana's blue ribbon fly fishing country. The renowned Yellowstone Spring Creeks are minutes away, and fly fishing instruction and guided fishing trips are easily arranged, as are day horseback rides or longer pack trips. The snow capped Absaroka Mountains rise to 11,000 feet above the valley floor, and provide many easy day hikes up to alpine lakes and meadows. Nine miles to the north is the historic old western town of Livingston, with a wonderful array of fine restaurants, art galleries and shops, and it is only an hours drive to Yellowstone National Park, through some of the worlds most beautiful scenery. On your way back to Deep Creek after a strenuous day of sight-seeing in the Park, stop at Chico, renowned for its world class restaurant, and take a soothing dip in the natural hot springs. Then come back to your home away from home and fall asleep, listening to the gentle murmurings of Deep Creek making its way down to the Yellowstone. Please email or call for reservations. A variety of custom designed vacation plans can be arranged for you before you arrive - do ask about these. Directions: Deep Creek Guest Cabin is located out of Livingston, Montana. .From Yellowstone: Take US 89 north from Gardiner for approximately 45 miles to Pine Creek Road, then turn right. Turn left onto East River Road and drive for three miles to Deep Creek. Turn right into Deep Creek House at 2719 East River Road.